Everyone says goats will eat anything, but the truth is that they are rather picky! Goats can be very particular about the quality of their hay. If it’s touched the ground they will probably snub it, even if it appears just fine to you. They are also good at wasting hay, so a necessity for every goat owner is a nice hay manger. You can use a hay bag (like these from Amazon), but it’s nice to be able to load up a manger and not worry about it for a few days. We made an upcycled hay manger, which was a lot of fun and useful for a while. Our first hay manger was simply a plastic tote. It worked okay, but the goats wasted a lot of hay. Our next rendition was a small homemade manger, about the size of the one pictured here on Grit, but without the nifty tub underneath. The goats took to sitting in that one, and we just slapped it together quickly and it wasn’t sturdy enough to hold their weight so we made goat hay manger edition three not too long later. Raise Goats In The City! Imagine pouring yourself a cold glass of milk, that you raised yourself! You can raise goats even if you don't live in the country. Find out how in the free email crash course on raising goats in the city. We had a futon that just couldn’t stand up to the abuse that our active kids were giving it and had been repaired so many times that the last time it broke I finally hauled it out to the garage for firewood. Then I got to thinking it would make a pretty good hay rack for the goats. My husband humored me and totally remade it. We took both arms off the futon and used those for the ends, then cut the sides down to a manageable size. A lot of the slats fell off, so when we placed them back on we reinforced them with screws. Is it toxic? Don’t use treated wood! And if your goats chew on wood (mine never did) don’t use painted wood. Is it strong? Goats like to jump and climb. Don’t let them get hurt because your project snaps in two. Are there any sharp edges? Cuts are no fun. Make edges smooth and not poky. Can their head get stuck? This is especially important if you have horned goats, but even goats without horns can often get stuck in strange places. 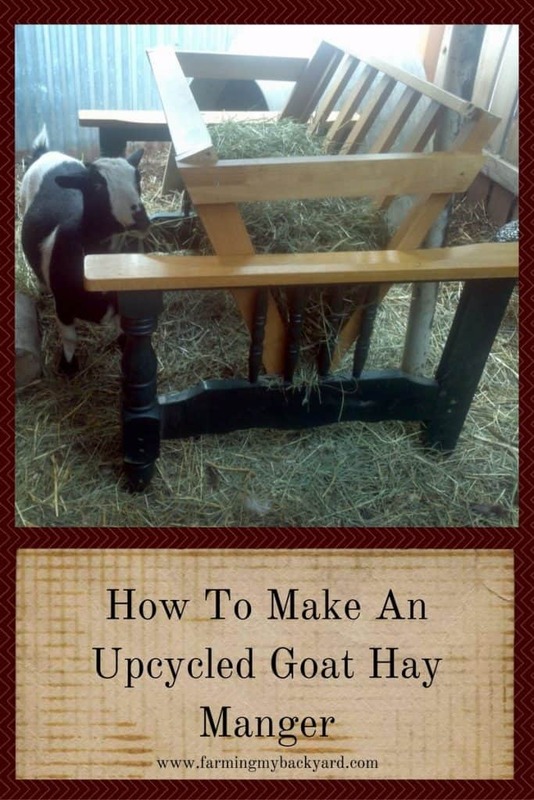 Here’s a DIY horn friendly hay manger from Spring Mountain Living. Can they pull the hay onto the ground? Goats like to grab a bite and then turn away, pulling a bit of hay onto the ground while they chew. Try to minimize lost hay if you can. How much can it hold? You don’t want to load up your manger TOO far in advance just in case there are issue with mold, but it is nice to have one that will last you a few days. I really like this manger and instructions from Goat World. It can hold two bales on their end, or part of one bale split apart (to check for interior mold). Our upcycled goat hay manger ended up not holding up to active goats trying to sleep in it any more than active kids trying to jump on it. But it was cute while it lasted! The fun part about an upcycled project is you can experiment and if you make a mistake it’s no big loss, because your materials were probably on their last legs anyway. Since this one didn’t last forever, we ended up making a new one in the same style, only using 2x4s and 3 inch screws. We also made it taller so the goats couldn’t sit in it and wider so that it could hold almost one bale at a time. That helped out with the hay storage on our small lot. So there you have it. Look around at what you have and see if you can repurpose it into something new and useful! Hi Kathryn, visiting you from Homestead Bloggers Network. Urban homesteading is what we are trying to do too, no animals yet though. Nice manger! Could you put the Hay on an old palet on the ground if its inside? Yes, but something with sides is nice once you open up the bale.